Well, I'm in the midst of painting my little girl's room. It's a week or more project. It's a lot of work. 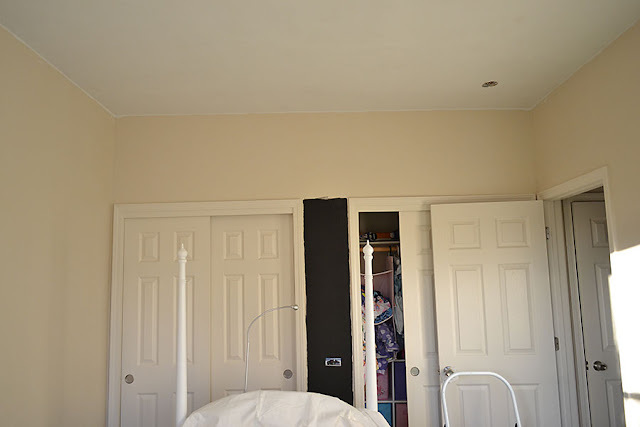 Remember when I painted my boy's room. Well, it's the same thing here. Lots of prep work. I hate the prep work. Well, this time I decided to add a magnetic wall for my girl. She loves to play with magnets on the refrigerator. So giving her a magnetic wall meant she could play with all those magnets on her wall and not clutter up my refrigerator. A white board might have been easier. 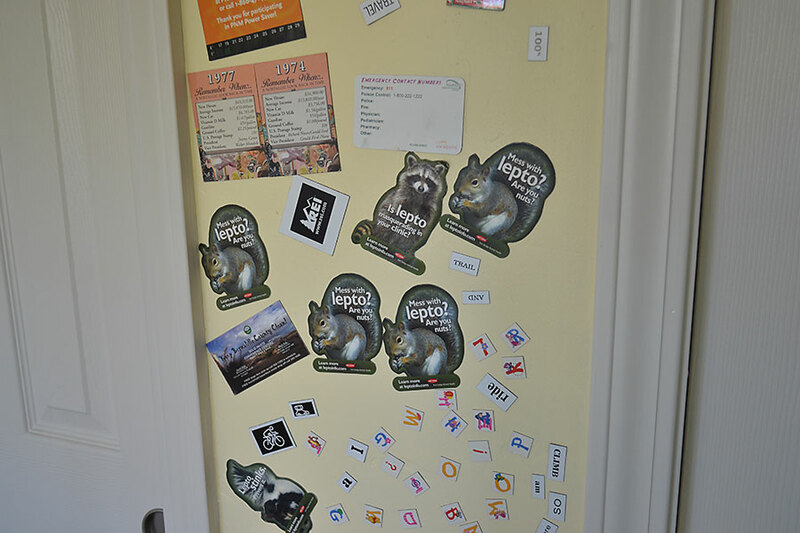 Although...the magnetic wall looks nice....and cluttered. I bought Rust-Oleum Magnetic Primer . The reviews on Amazon are pretty spot on. Should have read them before I did this. Oh well, I'm still happy with the result. Here's the room we started with. A beige box. I like beige, but not when it's all beige. Or when the paint is peeling off the walls. I did the whole big prepping thing with some help from Biker Boy. Then after washing the walls and applying the Peel Stop Clear Binding Primer , I painted on the magnetic primer. It recommends three thin coats applied every 30 minutes. I've read that others recommend at least 4 coats and I put on 5. It says on the box that the product goes on as a dark gray. What do you think? I say no. It's black. Black, black, black. And you need to stir that pot of paint a whole lot. I recommend using a foam roller and covering everything else that you don't want paint on. I used drop cloths, but didn't notice that the iron flecks in the paint splattered all over my floor moulding. Yuck. It was hard to clean up. Tape everything! And be aware that this stuff stinks. Really bad! I did this when the kids weren't home and had the windows open even though it was only 50 degrees outside. I had the air filter running and the house filter running. If I had a special breathing mask, I would have worn that. And it doesn't wash off skin very well. So protect yourself. I got some on me on Monday and it's still on me today (Thursday). I'd hate to do a big wall. Uff dah. 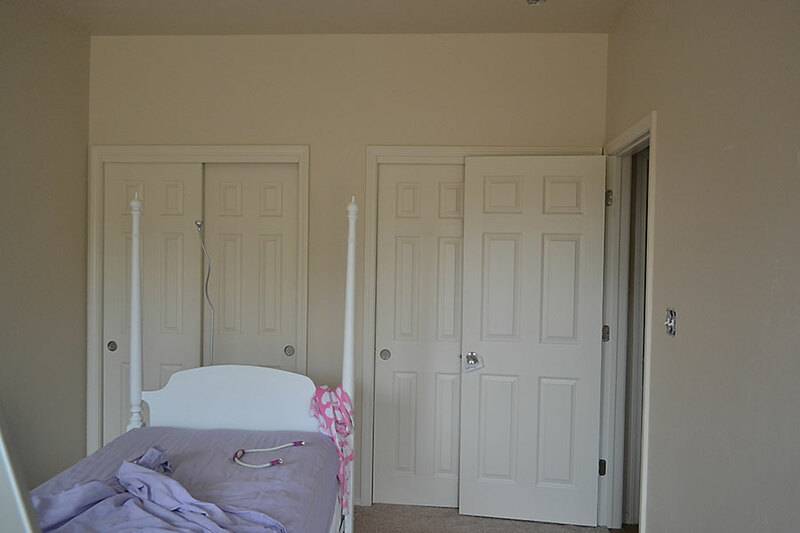 The walls in Chewy's room took 2 coats of paint. But the magnetic wall took 3 coats to make me happy that the black was covered. 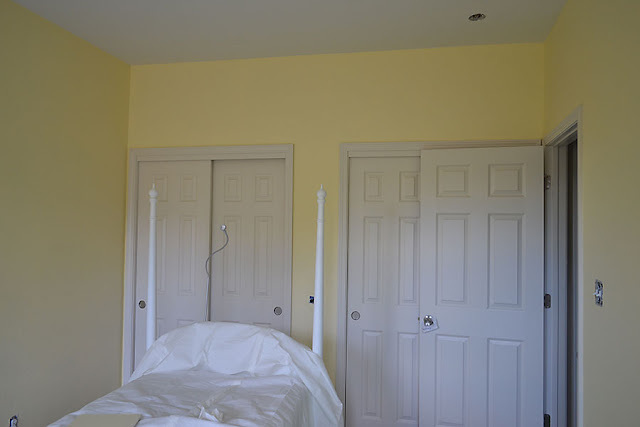 Then I finished all the yellow walls. I'll get to our color choice in another post. I also painted the ceiling white. 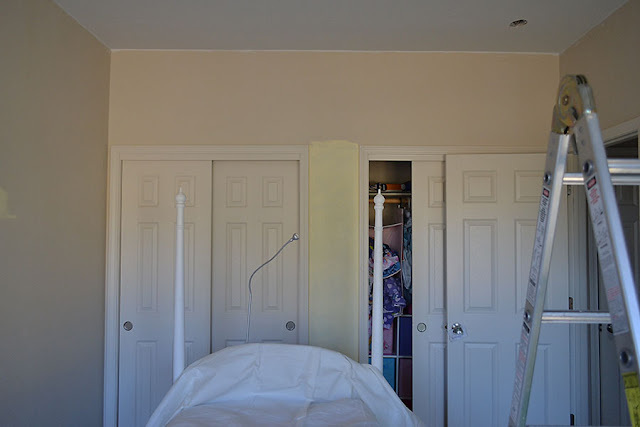 Now the closets and moulding look....really beige...makes me want to paint them white. But I've still got a stencil wall to do....more on that later. So the magnetic paint....thoughts? A pain in the patootie to put on in my opinion. But totally worth it to make a little magnet girl crazily happy. 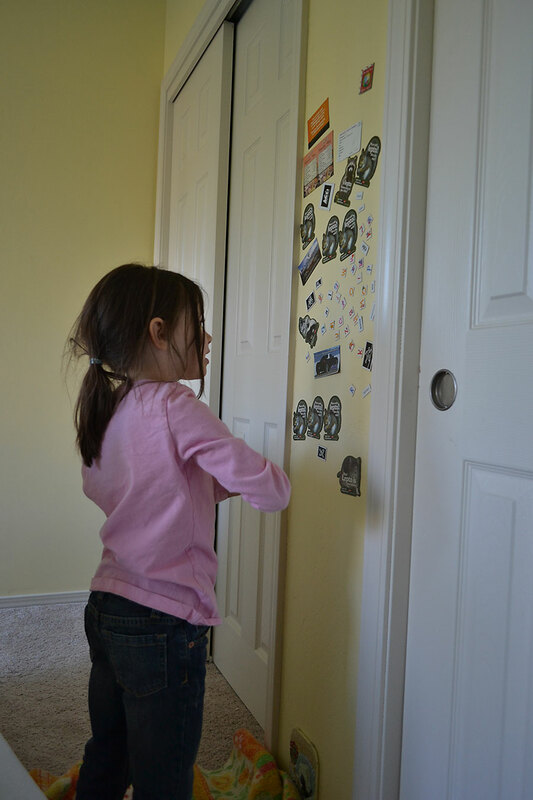 When I told her the wall was ready she went and got every magnet off the refrigerator and put it on her wall. 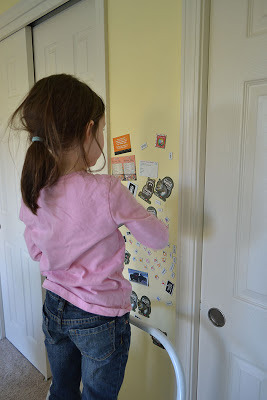 We learned the magnets need to be strong and light, especially if you want them to hold a paper up on the wall. Some new magnets may be in a little girl's Christmas gifts. Don't you love the ones we have? Classy. Have you tried magnetic paint before? Thoughts? I still like my chalkboard wall. But this is good now that it's done. And you can't even tell it's there....except for all those magnets. I guess your fridge was really relief that you’ve finally had another place for magnets. And this said magnetic wall is really cool. I love this idea. Maybe I should start looking for a place to have it on our house too.